Somehow, Bennett found enough coaching and motivation in the 'Sunshine State' to emerge as a highly sought after scoring forward. The fall after he was drafted by the Pens, he entered the University of Denver to hone his skill and hopefully, bulk up. That’s when the injuries started. First, his right knee during his freshman year. Then, came the wrist injury in October of 2011. 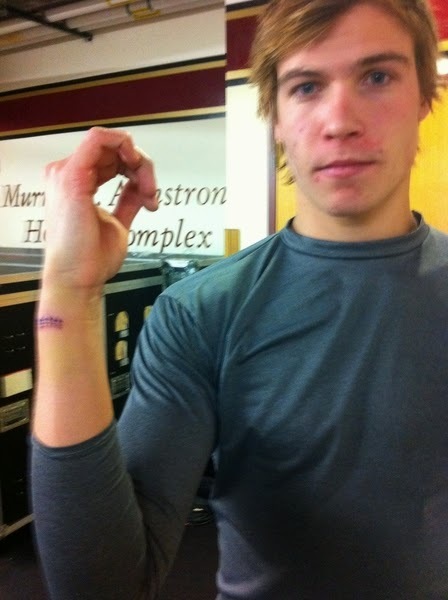 It was his sophomore year at DU and he injured his wrist during practice. He missed four games but continued to play recording five points (2g, 3a) in a four-game scoring streak. In December he was sidelined after having successful surgery to repair a ruptured tendon in his wrist. He recovered from that surgery and was called up to join the Penguins in February of 2013. He scored his first NHL goal on February 24th and kept rolling with the team thru the playoffs. On November 22, 2013, the night Sidney Crosby scored his 250th goal, Bennett fractured his wrist requiring another surgery. He hasn’t played since. In fact, when it looked like he might be close to returning, the ever cryptic Penguins announced he had suffered a “setback” and would need an additional three to four weeks added to his recovery timetable. He has been slotted to be a top six forward but is it too late for that this season? The Neal, Malkin, Jokinen line has chemistry which is important for Geno’s production. The Kunitz, Crosby pair, after struggling to fill the void left by Dupuis, has begun to gel with Lee Stempniak. It seems certain when he returns Bennett will add much needed depth, likely playing along-side Sutter. We all know that injuries are part of the game. Is Bennett fragile or just unfortunate? Will that surgically repaired and inevitably altered wrist retain the magic potential it once held? Only time will tell but, as we move toward the playoffs, the Pens need a healthy Bennett like a cloudy day needs the sun.